The face mask is used to correct skeletal imbalances where the lower jaw is in front of the upper jaw (Underbite). This correction occurs mostly by moving the upper teeth and upper jaw (maxilla) forward. The face mask will attach with rubber bands to the palatal expander. The face mask will be worn for 12-15 hours a day until an over-correction of the bite has been achieved. We also use TAD supported facemasks in our practice for more severe cases of underbite. Sucking fingers or objects such as blankets for extended periods of time can have deleterious effects on patient’s teeth. Habit appliances are used to stop digit or other habits for young patients. These appliances are cemented to upper molar teeth and prevent patients from sticking their fingers or other objects in their mouths. After a period of time, the patient will stop the habit and the position of patient’s teeth will improve. A palatal expander is used to widen the upper jaw so that the bottom and upper teeth will fit together better. The upper jawbone, or maxillae, is made up of two bones connected by a suture in the middle. This suture does not fuse until the early-middle teenage years. Palatal expanders are cemented to upper molar teeth and require to be turned once a day/every other day until the desired expansion is achieved. During this process, a gap may open between the two front teeth and the upper jaw (maxilla) is widened. This gap is usually closed by the orthodontist with braces. 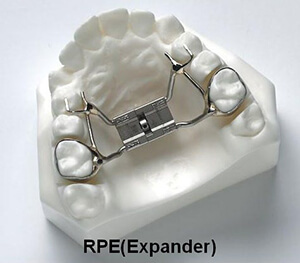 After expansion, the expander must stay in place for several months in order for the new bone to mature. 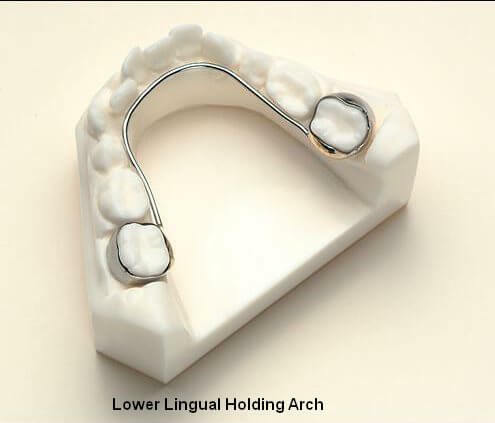 The lower lingual holding arch is designed to maintain the position of the adult lower molar teeth as the baby 2nd molars teeth are lost. The permanent teeth that will replace these baby teeth are smaller. By preventing the molars from moving forward, space can be gained which could be used to alleviate the crowding of the front teeth. 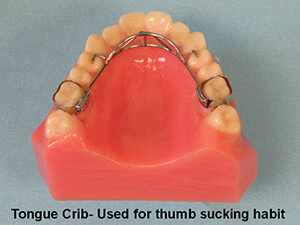 It is also placed in case of early loss of primary (baby) teeth to prevent drifting of the molars forward. 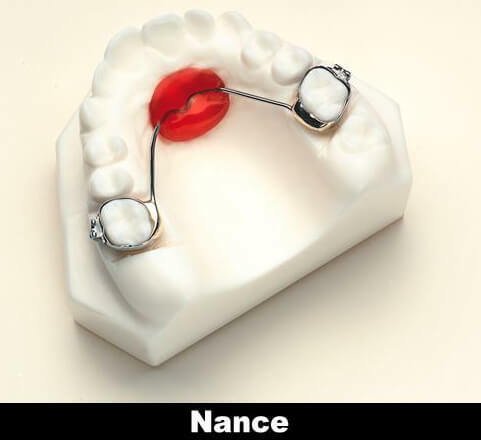 The Nance holding arch is designed to maintain the position of the adult upper molars as the baby 2nd molars teeth are lost. The permanent teeth that will replace these baby teeth are smaller. By preventing the molars from moving forward, space can be gained which could be used to alleviate the crowding of the front teeth. It is also placed in case of early loss of primary (baby) teeth to prevent drifting of the molars forward. 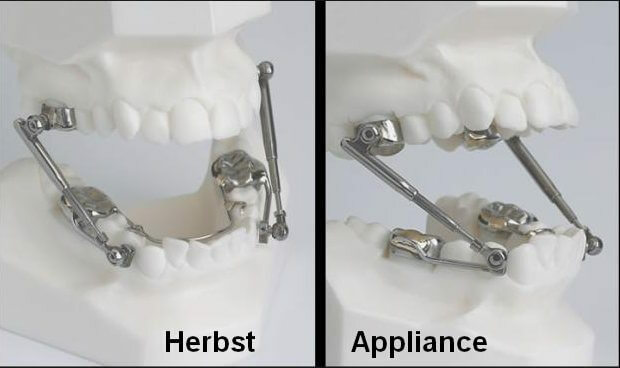 The Herbst appliance is used to correct skeletal imbalances where the lower jaw is behind the upper jaw . The Herbst applianceis used to help the lower jaw develop in a forward direction. Herbst appliance is fixed to your child's molars. It includes a metal tube that connects the upper and lower jaw. By adjusting the tube, your orthodontist is able to control the jaw's position in relation to the upper teeth. Typical treatment time with a Herbst appliance is 12 months, though this may vary depending on your child. The Herbst appliance has orthodontic bands that are cemented to the upper and lower molars. The appliance connects the upper and lower jaws with rods and tubes that position the lower jaw forward into a normal position. In order to achieve the desired change in the skeletal pattern, the Herbst appliance is worn for 9-14 months. After the Herbst appliance is removed, you will either go straight into braces or Invisalign trays. 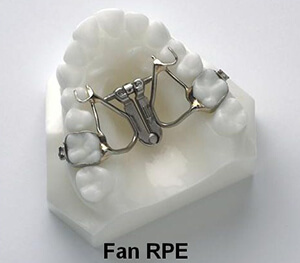 Forsus appliance is a non-compliance spring used to correct overbite and overjet in patients with class II malocclusions. 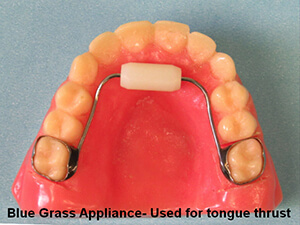 This appliance will replace the use of elastics in patients. . 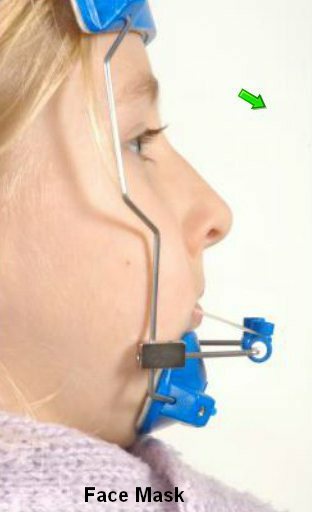 It works with existing braces and wires and doesn’t require an external apparatus (headgear). 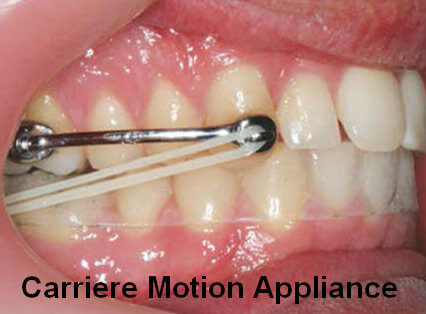 Carriere appliance is used to limit extractions and to turn difficult Class II patients into simpler Class I patients. This appliance can be used with aligner or braces and has a very low profile which leads to great comfort for our patients.